It is morning in Hweka, deep in northern Burmas Kachin State. Outside the window, the roar of the river below awakens us from our slumber, nudging us groggily into yet another day. 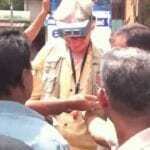 Already it has been four long days since leaving Mandalay; when we will reach our destination is still uncertain. Nevertheless, we are unfazed, our spirits are high. Because we are convinced. Today is the day. Today is the day!. For the past 125 years, textbooks and museum displays have relied on the beauty of tiger’s eye to add interest to an often dry description of pseudomorphism, a term that simply means the replacement of one mineral by another while preserving the form of the original mineral. Mineralogists once thought that the stunning play of light emerging from tiger’s eye resulted from the infiltration and dissolution of the fibrous mineral crocidolite, a deep blue, asbestos like silicate, by hot waters rich in dissolved silica. Tigers eye was viewed as a spectacular form of chalcedony and is often included as a variety of quartz in mineral guides. Afghanistan’s ruby/spinel mines are one of the great mysteries of gemology. 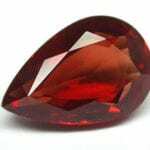 Historically, rubies and red spinels have been produced from four areas: Burma, Sri Lanka, the Thai/Cambodian border (ruby only; no red spinel) and Afghanistan. 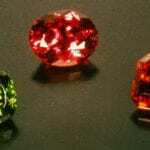 While extensive accounts exist regarding the other deposits, in the twentieth century, little has been written about the rubies/spinels of Afghanistan. Indeed, many are totally unaware of the Afghan occurrences. Amber begins as resin exuded from trees millions of years ago. 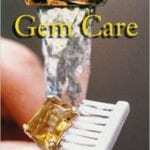 All known deposits of amber come from various tree species which are now extinct. Baltic amber was produced by a tree called Pinites succinifer, a tree sharing many characteristics of the currently living species Pseudolarix. In appearance it would have looked something similar to a pine or spruce tree. 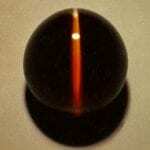 Amber’s warmth and rich glow convinced our earliest ancestors that it was petrified sunlight. Later, others believed it to be the hardened tears of a goddess. Those who were more earthy described amber as fossilized lynx urine. 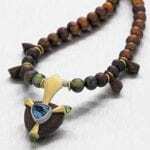 One of the most beautiful blue gemstones is native to our own country. 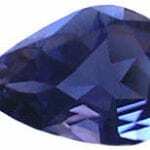 In 1906, a prospector found what he thought were sapphire crystals in the Diablo Mountain range of San Benito County, California. A year later, mineralogist, G. D. Louderback, identified them as a new mineral which he named benitoite. 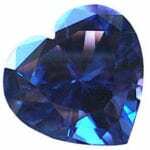 Nature lavished her finest blues upon sapphires, the “Gem of the Heavens.” Although the word “sapphire” itself means blue, the gem is found in nearly all the colors of the rainbow. 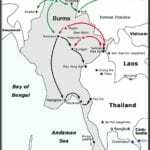 The history of Burmas jade mines in the West is a brief one. 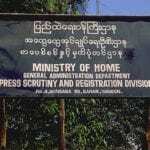 While hundreds of different reports, articles and even books exist on the famous ruby deposits of Mogok, only a handful of westerners have ever made the journey to northern Burmas remote jade mines and wrote down their findings.Occidental accounts of the mines make their first appearance in 1837. Silicon dioxide, better known as quartz, is one of the most abundant minerals on Earth. Mineralogists divide quartz into two classifications: crystalline and cryptocrystalline, based on the size of its crystals. 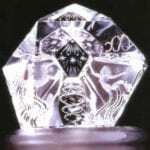 Cryptocrystalline is also called microcrystalline quartz. The region of pegmatite dikes in the state of Minas Gerais in Brazil has been the primary source of gem beryl and several other species of colored gemstones for many years. Rivers have cut places through the dikes and alluvial deposits, called ‘cascalho’, which are. On an excursion in the Alps in 1797, mineralogist, R. J. Hauy discovered some highly vitreous, piezio-electric wedged-shaped crystals that resembled schorl, the dark variety of tourmaline. The incorrect designation, ‘vitreous schorl’, was used even after axinite was identified as a complicated borate silicate group of minerals. The characteristic axe shape of its crystals gave it its name..
Dioptase incorporates the native metal, copper in the Si6O18 ring structure with water to form the only gem material that so closely approaches the finest color of emerald. The small and well-defined deep green rhombohedral crystals develop in oxidation zones of weathering copper ore deposits. Its growth in voids of dolomite and limestone formations and irregular druse cavities is often in association with malachite and smithsonite, but admixtures and inclusions seldom occur. 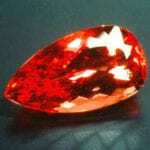 This article discusses the decline of Thailands ruby mining industry. The author warns that Thailand faces future problems is the countrys leaders do not pay greater attention to environmental protection. Earring “Flamma”. Damascus: Demidov V. Artel “TAU”. Saint-Petersburg. Russia. 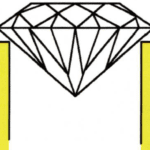 Artel “TAU” creates jewelry designs, video and photography. 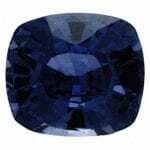 If each sapphire deposit has its own unique chemical mix, in theory it should only be a matter of careful analysis to figure out where a stone came from. 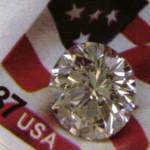 But there remains an element of art to determining country of origin, partially because of the limitations of the science itself, and partially because no one has yet compiled complete data on each gem locality..
Foreign affairs – A well-known European dealer sells a 2.5-carat Möng Hsu ruby to a major jeweler in Europe. 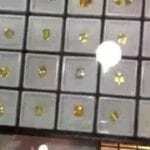 This jeweler then sells the stone to a Japanese client through their Japanese subsidiary. 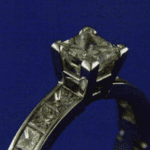 The client now takes the stone to a gemological lab, which issues a report stating that the gem’s fractures are filled with a foreign substance. Now the fun really starts. Beryllium is a hard and shiny metallic element. 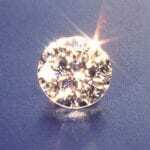 Extremely rare, it’s prized in industry for its high melting point and conductivity. Combined with other elements, it forms beautiful gemstones that are hard and brilliant. 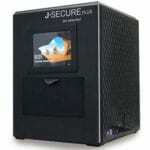 Historically gem possession has been reserved for wealthy, royalty, or high religious leaders. 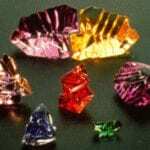 It has always been human nature to want what others possess, so imitation gems have been common for some 4,500 years, in the form of glass, plastic, composites, and treated gems. It is not against the law to imitate, as long as the true identification is given. 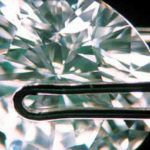 It is only fraud when imitations, natural or synthetic, are passed off as a more valuable gem at an inflated price. Every substance on Earth falls into one of three groups: animal, plant or mineral. Minerals are compounds of elements, like carbon, chromium and silicon. 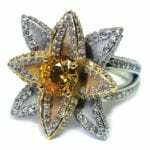 Gemstones are simply minerals that people have deemed attractive and, therefore, valuable. Quartz, the most abundant mineral, is also one of the most diverse minerals known. It’s found in a rainbow of colors, and ranges from shimmering transparency to impenetrable opacity. 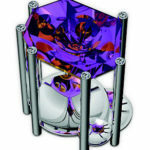 Rock crystal, amethyst, and. 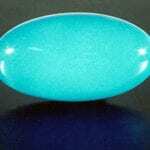 Prized for its sky-blue color, turquoise has been used in amulets and jewelry since antiquity. The oldest known piece of jewelry is a turquoise and gold bracelet found in the tomb of Zer, an Egyptian queen who lived 7,500 years ago. Goshenite is the transparent, colorless, alkali-bearing pure beryl that was discovered in Goshen, Hampshire County, Massachusetts. The Lily Pond mine in a pegmatite near a small lake was the source of crystals accompanied by other pale greenish-blue, bluish-green, yellowish, pink, and white beryl crystals. The art of gem cutting (glyptics in Greek) is one of the oldest testimonies to how installed, fascinating miniatures can transform gemstones into tiny works of art with immense charisma and magical significance. 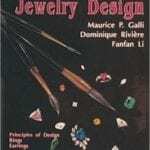 Decoration, symbols and magic formulae that still fascinate and have given gemstone engraving a special place in the cultural history of mankind. My cats like to participate in most of my activities. Their “assistance” generally involves batting supplies off my desk. When they sit and stare at me, it’s easy to see how one of my favorite gemstones, cat’s-eye chrysoberyl, got its name. Silicates comprise about a quarter of the known minerals and almost 40% of the common ones. The basic unit of structure of all silicate crystals is the tetrahedron. There are four oxygen atoms, one located at each apex of a regular tetrahedron. A single silicon atom is located at the center of the tetrahedron. 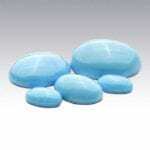 This silicon atom has a valence charge of 4, meaning that it is looking to acquire four electrons through sharing with other atoms to complete its outermost energy shell, known as the valence shell..
Two gemstones bear the name jade: nephrite and jadeite. 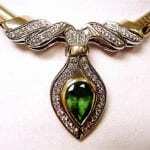 Nephrite, first known as yu, was treasured by the Chinese for centuries. 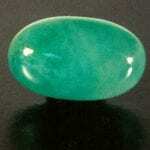 Its current name, and the word “jade,” both came from the Europeans via the Spanish conquistadores who. The minerals grouped as jasper belong to the quartz family. Quartz is one of the most abundant minerals on Earth. 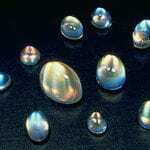 It’s formed primarily from silica and oxygen, but includes trace amounts of dozens of other minerals. Because of these ineralogical impurities. Andalusite, kyanite, and sillimanite all contain identical amounts of aluminum, silicon, and oxygen, combined with other trace elements. I find it intriguing to note the differences in how the chemical formulas for these three minerals are expressed by many well-known authorities on gemstones. That list includes. 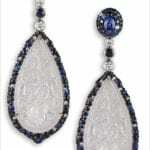 Lapis lazuli, as lovely as its exotic name, has decorated humans and enhanced their art for thousands of years. 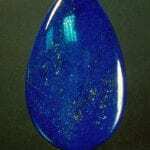 Normally a rich deep shade of blue or blue-violet, lapis lazuli may at times have a slight greenish cast. Opal is a fascinating gemstone with an ancient history. 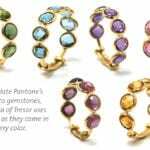 Pliny the Elder gives an eloquent description of opal, comparing its many colors to that of the finest of ruby, emerald, sapphire, topaz, and amethyst. 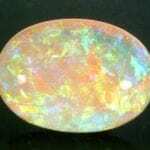 Romans prized opal so highly that one citizen of the highest rank suffered permanent exile for refusing to relinquish ownership of a magnificent hen-egg sized opal to the emperor..
Australia’s most famous opal mines lie on the periphery of this Great Artesian Basin. Mintabie, Coober Pedy, Andamooka, White Cliffs, and Lightning Ridge form an arc along its southern edge. Yowah, Quilpie, and Opalton project on a line north/northwest from Lightning Ridge. Some believe that untold riches, just waiting discovery, lie beneath the unexplored areas of this vast region. However. Staurolite! Why would one of the most ordinary, patently unattractive minerals, used as a religious talisman and a good luck charm for centuries, be, in its transparent faceted form, a much sought after collector’s gem? Rarity! 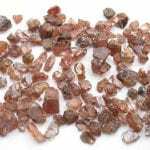 Seldom do the dark reddish-brown or yellowish-brown transparent crystals occur in sufficiently light tones and sizes to warrant faceting. 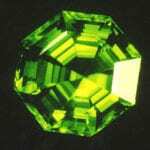 Peridot, often called olivine and chrysolite, is a gem variety occurring in the solid solution series between fosterite (Mg2SiO4) and fayalite (Fe2SiO4). The members of this most common solid solution series of the olivine group are the primary crystallization products of silica-poor but magnesium and iron-rich magmas. Olivine frequently coexists with plagioclase and pyroxenes in igneous rocks. Magnetite, corundum, chromite and serpentine are its associates in crystalline dolomitic limestone formations. 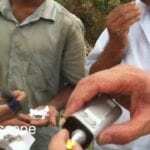 It readily alters to serpentine minerals, such as antigorite, and to talc, limonite and hematite.. 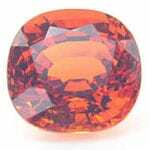 Lets Talk Gemstones – Zircon is the single member of the zircon group of the nesosilicates that is suitable for use as a gemstone. In the nesosilicates, independent SiO4 tetrahedra are connected only by ionic bonds. 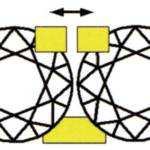 Because the tetrahedra are not linked to form chains. 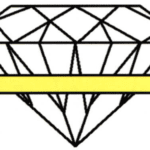 Although gemstones are hard substances, they aren’t indestructible. Some can be ruined by contact with certain chemicals, while others break easily. Many are susceptible to surface scratching, which can ruin them. Richly colored morganite gems are among the more valuable of the secondary gemstones. 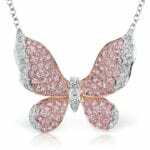 The value of morganite has increased with the expanding knowledge of the gem-buying public. 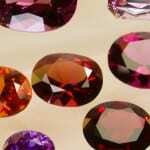 The more informed consumers become about gemstones, the more it fuels the growing demand for colored gems. Freeform gems, carvings, and new faceted designs join the popular and traditional step-cut rectangle with truncated corners and are appearing in displays more frequently. 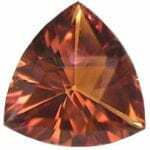 Beryl’s combination of desirable physical properties and its many color choices make the variety of morganite a gem suitable for all types of jewelry..
Garnet is a common mineral distributed worldwide. It occurs as crystals, in massive and granular forms, and as tumbled pebbles. It can form under a wide variety of geological conditions, but high temperatures are essential for its development. 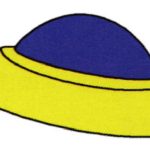 It is of major importance as a rock-making mineral in igneous, metamorphic, and sedimentary rocks. 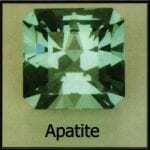 It alters frequently to chlorite, serpentine, and talc. Chemical stability and resistance to weathering permit excellent crystals to be found in alluvial deposits. It is known that inhabitants of the American southwest still recover crystals from the desert sands and ant hills there. 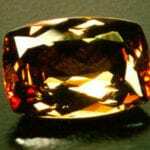 Garnet has imperfect cleavage, but it can exhibit an unusual angular fracture. This ability allows it to retain sharp cutting edges. 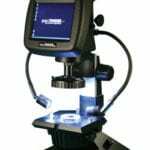 Industry takes advantage of this property and its hardness to produce abrasive papers and cloths that are two to six times more efficient than those of quartz. Previous articles discussed the polymorph gemstones andalusite, sillimanite, and kyanite of the Al2SiO5 group of the nesosilicates. 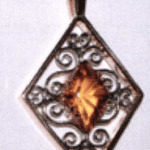 Topaz and staurolite are the two remaining minerals of this group used as gems. In the nesosilicate structure of orthorhombic topaz, independent. 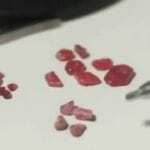 This video provides an overview of lead glass-filled rubies and explains why it has begun to call them a “manufactured product” on reports. The fragile opal first flashed its fiery colors at mortals millennia ago, igniting a love affair that has survived the fickleness of the human heart. Its faults, like softness and lack of stability, are overlooked by those entranced by its beauty. 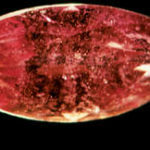 Like many gems, rubies are known by several names. 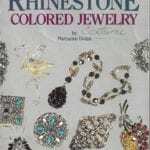 One of its earliest titles was ratnaraj, which is Sanskrit for “king of gems.” Another early name was carbuncle. 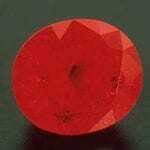 At a time when gems were classified by colors only, carbuncle was the name given to all red gems, including rubies. 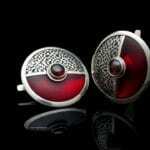 The current word, ruby, is derived from the Latin word for red. 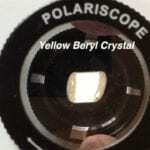 An old lapidary taught me an excellent trick for sealing cracks in gemstones. 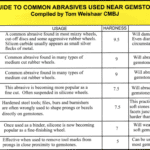 Some gems are inherently unstable. If a client of mine wants one of these gems for inlay, or to be cut or set, I will often use this technique – with full disclosure, of course – to make the stone suitable for use in these applications. 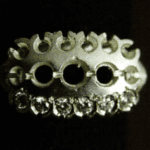 Also, with the growing trend of repurposing old jewelry, I am seeing more sentimental gems coming across my counter that require repair rather than replacement. Enter the epoxy technique. Tanzanite! 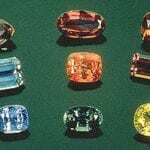 Baron Sigismund Zois von Edelstein of Slovenia could never have imagined that a variety of the mineral he discovered in 1805 in the Sau-Alp Mountains would cause tremendous excitement in the jewelry industry more than a century later. 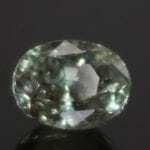 The name zoisite has replaced the name saualpite that he bestowed upon this member of the epidote group of sorosilicates. 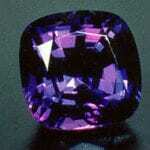 Due to tanzanite fragile nature, the stone is very easy to abrade, scratch, or chip during the setting process. When hammering or tightening a tanzanite, use great care and develop a habit of regularly checking for proper fit and metal contact with the stone as you go. 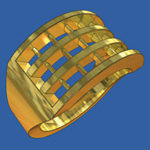 Abrasions and scratches often occur during the final prong shaping. 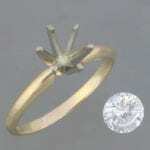 Therefore, shape the prongs as much as possible before setting the stone. 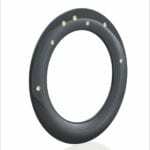 Once the stone is set, finish any shaping with a safety-edge file. Ask any jeweler to list the gemstones with which they prefer to work, and sapphires and rubies would undoubtedly rank near the top. With a hardness of 9 on the Mohs scale, these popular varieties of corundum have long been considered nearly impossible to damage, and they can easily withstand the melting point of even high karat gold solders. 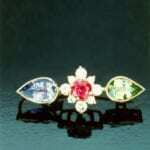 Not surprisingly, many jewelers feel a comforting sense of security when faced with a ruby- or sapphire-set piece. Which may be a problem. Long associated with Spring and birth, gloriously green emeralds have an extensive history of healing and supernatural powers. Green is Nature’s most soothing color, and early physicians instructed their patients to look through pieces of emerald to ease fatigue and treat eye diseases. Even in the wide and varied world of gemstones, cacholong is pretty obscure. The stone has certainly generated its share of confusion. Also known as kascholong, the stone is actually a variety of opal, but this hasn’t stopped it from being listed as an agate on more than one occasion. 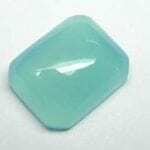 It has also been described as either chalcedony or hydrophane opal. 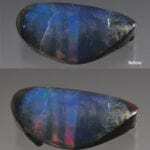 The fact that it is sometimes known as “mother of pearl opal” only adds to the complexity. Think they just lie around? Oh, no! Rocks are constantly meeting, mingling, and occasionally making gemstones. Every so often you hear about a miner who literally trips over a rock, or takes a good. hard look at the ground in just the right place, and suddenly discovers a gemstone deposit. For the serious prospector, though, finding a deposit requires a good grounding in how the Earth is put together – the different types of rock you encounter and the conditions under which they formed. all of which determine whether or not gems could have grown there. 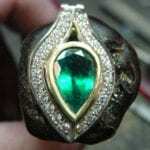 The gem’s first known owner was Abu Said, a Moorish prince of Granada in Spain in the mid-1300s. Abu Said lost the gem, as well as his crown and his life, to Don Pedro the Cruel of Seville. In 1366 Don Pedro’s own brother attacked him in turn, but Don Pedro successfully defended himself with help from the armies of the Black Prince of Bordeaux. As payment, the Black Prince demanded Don Pedro’s prize jewel, and Don Pedro was in no position to. Moonstone and sunstone, seemingly opposites because of their names, are in reality closely related members of the feldspar family. Formed when hot magma solidifies underground, feldspar makes up about 60% of the Earth’s crust. It’s found worldwide in one form or another. 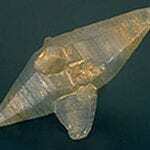 Mineralogists have identified at least 40 varieties of feldspar. 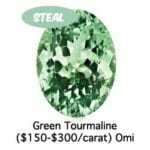 Tourmaline is one of the most unusual of all gemstones. 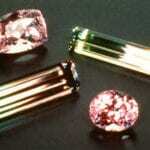 Unlike other gems, which we often identify with a single color, tourmaline comes in every hue. 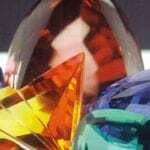 Often more than one color occurs in the same crystal. 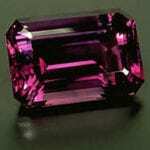 Watermelon tourmaline, which is pale. The sorosilicate class of minerals is composed of more than seventy minerals. 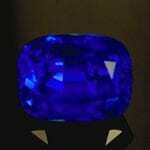 Most are rare, and only a few are used as gemstones or are cut for collectors. 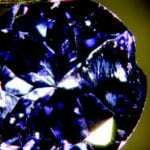 The exception, the lovely tanzanite of the zoisite group that forms in the orthorhombic crystal system, was discussed in a previous article. 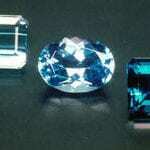 Since the optical and physical properties of the lesser known varieties vary and their use as gemstones is not common. With the exception of orthorhombic zoisite (tanzanite and thulite), discussed in the first article on the sorosilicate class of minerals, the members of the epidote group form in the monoclinic crystal system. Allanite, clinozoisite (the dimorph of zoisite), epidote, hancockite, mukhinite, and piedmontite are members of this group. 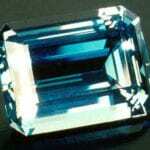 The varieties of beryl found worldwide include one of the most prized and one of the lesser valued of gemstones. 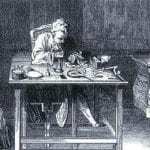 The now exhausted mines south of Koseir in Egypt provided Cleopatra with precious emeralds, including, reportedly, one engraved with her portrait. Goshen, Massachusetts is a source of the little known and relatively inexpensive namesake, the colorless ‘white’ or ‘lucid’ beryl called goshenite. 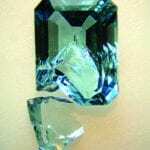 Aquamarine, heliodor, morganite, and the color designated varieties of beryl, that include yellow, golden, yellow-green, green, and red beryl (bixbite) compose the other members of this group. . 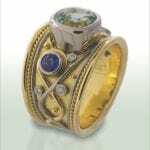 Ask three accomplished designers to create around a gemstone carved by one talented lapidary and what do you get? Three unique designs that not only capture the complexity of this one-of-a-kind stone, but also reflect the distinctive signature styles of each designer. On the following pages, Klecka, Crevoshay, and Schneider tell why their design choices complement the beauty of this exceptional gemstone while conveying their personal styles. Vietnam produces rubies as good as anything from Burma. But the machinations and intrigue surrounding the gem business in that country have left this potential largely unexploited.